Every Halloween, we have a big party for the kids and a chili cook-off for the adults, at our church. Naturally I enjoy the competition, who wouldn’t right? This takes me into my food “lab” where I come up with new chili recipes. In fact, after we returned from Hawaii one year, I created “Maui Chili” with pineapple, pork and white beans. 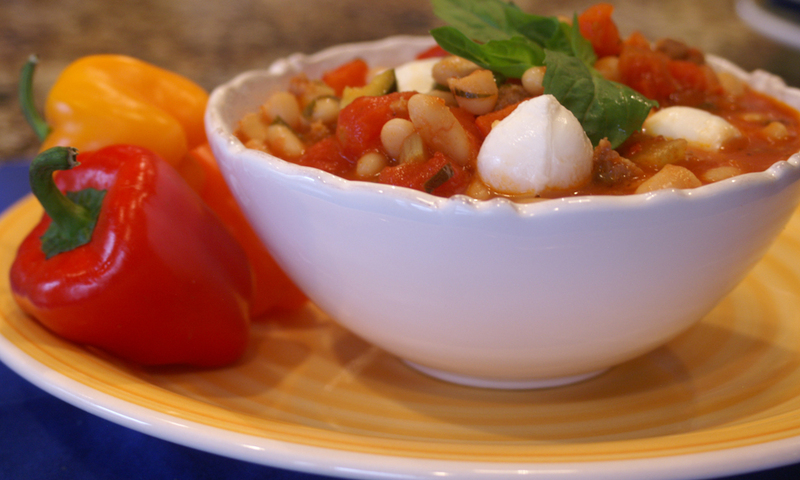 Then one year, I concocted “Tuscan Chili” with typical Italian ingredients, including little mozzarella balls-yum! Another year, I created a “Mexican Chili” using chorizo, fresh tomatillos and Mexican cheese. They were all a hit and I actually won a couple of times too. I even entered the Tuscan Chili in a cooking contest-although I didn’t win, I love this photo, which my dear friend Debbie took for me. I thought, with a photo this nice, I would win for sure-not true unfortunately. So now you get to enjoy the recipe and the photo too! Remove casings from sausage. Sauté sausage, onion, and garlic until cooked through. Put into crock-pot. Cut peppers into 1/2″ pieces. Peel and slice carrots. Clean and slice celery. Sauté all of these vegetables in olive oil for a few minutes; add to the crock-pot. You really don’t need to pre-cook these, but I think it enhances the flavor. Add zucchini, drained kidney beans, plum tomatoes (use juice; I cut them up with kitchen scissors) and tomato paste (with 2 cans of water-or omit for a thicker sauce). Stir to combine. Now the fun part…I never measure herbs so just go for it. I put in a nice handful of chopped fresh basil. The rest I just threw in but here’s my best guess…about 2 tsp. of Herbs de Provence (or Italian Herbs), 1-2 tsp of red pepper flakes (depending on how much heat you like) and 1 tsp salt, pepper, garlic and onion granules. After adding the spices, taste your chili and adjust as you like! I cooked this concoction for about 4 hours on high and it filled my large crock-pot. Right before serving, I stirred in some fresh parmesan cheese and the mozzarella balls, which melted after about 5 minutes. Oh man was it ever good…Enjoy!! This looks and sounds Delish! I can’t wait to try it. Although I should and probably will make this one in the next week, its full of the yummy nutritious stuff I’m always trying to get the man folk around here to eat! We want Maui-Wowie Chili !!! Oh. My. Stars. Chili with fresh mozzarella in it? I think I just fainted and woke up in food heaven!